Sunday was a day of surprises. I had expected to have a somewhat disappointing day on a stream that was once my favorite stream but is now just a pale shadow of what it once was. I chose it only because every other stream within a three hour drive was running about 10 times normal flow. This particular stream was running low and reasonably clear. 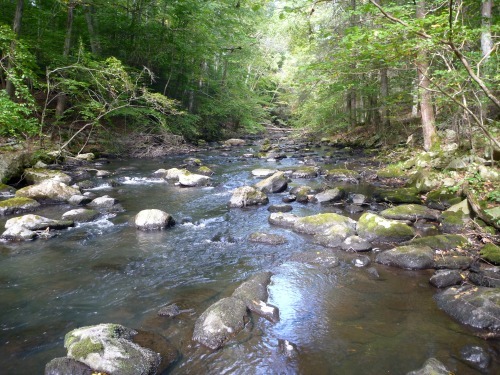 It is a 2.5 mile tailwater running between two NYC water supply reservoirs, and its flow is steady as a rock. Actually that steady flow is one reason why it was my favorite but no longer is. When I first started fishing it, it was steady as a rock at 31 or 32 CFS. Now it runs at 7-9 CFS, consistently. Two other factors have dramatically reduced its allure. 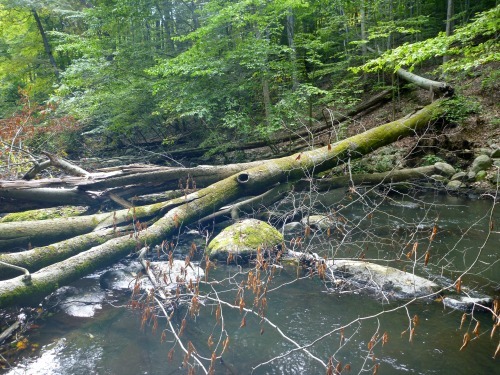 A couple hurricanes over the last 10 years have dropped multiple trees into the stream. Much of it now is unfishable. Finally, it now has didymo, which makes it unpleasant to fish. The last few times I fished there were disappointing and I kept thinking I might never go back. Well, after fishing there Sunday, I'll definitely go back! The fish were not large. 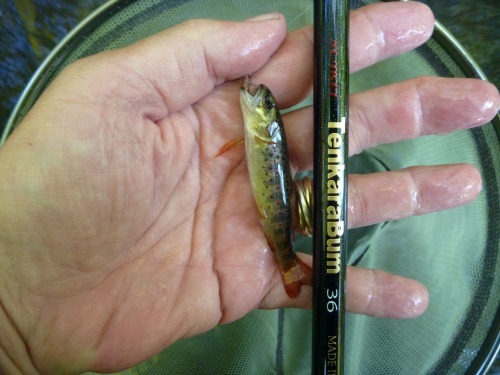 They almost never are in that stream, but most were not as small as the one shown above. And there were lots. It was a many, many day (the first I've had for quite a while). The goal for the day was to fish the TenkaraBum 36 with a range of line weights. At the recent Oni school, I had been very surprised to see Oni fish a size 4.5 line. I had always thought he fished a very light line, but he matches the line to the conditions. 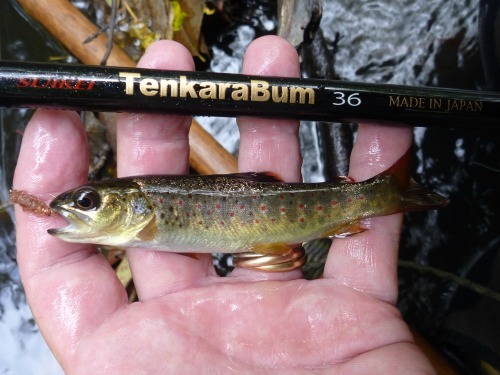 On Sunday, I fished the TenkaraBum 36 and the TenkaraBum 33 with lines ranging from size 1.5 to size 5. The plan was to start with the 1.5 and fish until I caught a fish, then switch to a size 2 until I caught a fish, then a 2.5 and so on. For most of the day I fished a Killer Kebari, which when wet looks quite a lot like a caddis pupa. The stream does get some mayfly hatches, but caddis are more prevalent. 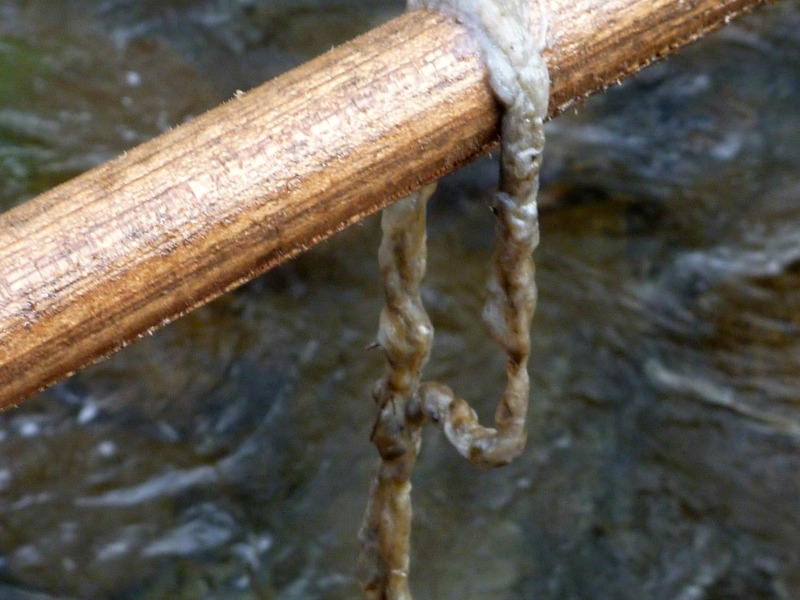 On this particular stream - and on all the nearby tailwaters - the Killer Bug and Killer Kebari tend to work very well. Because the fish are not large, and are all wild, they could be about anywhere in the stream. Stocked fish tend to congregate in deeper pools. Wild fish, particularly smaller ones, could be in ankle deep water if there is a current to bring food and a rock to hide under. Oni teaches to get in the best position before making your first cast, but take another look at the Low Water photo above. There could be fish everywhere! At one point I was able to catch three fish without even moving my feet. More than once, after catching a fish and changing to a different line size, it only took one cast to catch another fish and change lines again. With both the TenkaraBum 36 and the TenkaraBum 33, I was able to cast all the lines I had brought - from size 1.5 to size 5. I will say that both rods did better with the middle range. I could cast the size 1.5, and the presentation was incredibly delicate, but it requires quite a bit of concentration to get the line to fully extend on every cast. Similarly, the size 5 line takes quite a bit of concentration to cast softly enough. The line tends to fully extend and then bounce back because it still carries too much energy. The realization that Oni fishes a full range of line weights depending on the conditions forced me to do a complete reevaluation of lines and when to use what line. Ever since starting to carry the Oni line, which comes in a size 2.5, I have mostly fished the 2.5 line. On Sunday, I was a little surprised at how much better I liked a size 3 line with the TenkaraBum 36 (I also liked the Sunline). With the slightly heavier line, casting was almost effortless. Good casting form was still required of course, but the line rolled out and rolled over as if that's what it WANTED to do. Size 3.5 was also effortless, but seemed just a little heavier than necessary. I caught a fish on the first cast with size 4 so I only got one cast with it before switching lines. I only got two casts with size 5. With the TenkaraBum 33, a slightly heavier line seemed optimal. It will cast the size 1.5, but you really have to focus on what you are doing. In switching to heavier lines, each was better than the last, up to the 3.5 and 4, which, as Tom Davis had said in his review, seem to be the best lines for the rod. Size 5 was again hard to cast softly enough to prevent it from fully extending and then bouncing back. For nearly the entire time I fished a size 14 Killer Kebari. 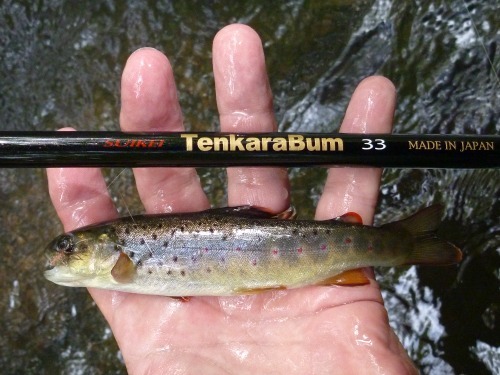 After catching my fish on the size 5 line with the TenkaraBum 33, and thus completing my "challenge," I though that for the heavier lines, a larger, bushier fly would have been a better choice. I have mentioned this thought before, but I see the rod, line and fly working together as a system rather than as three independent things. 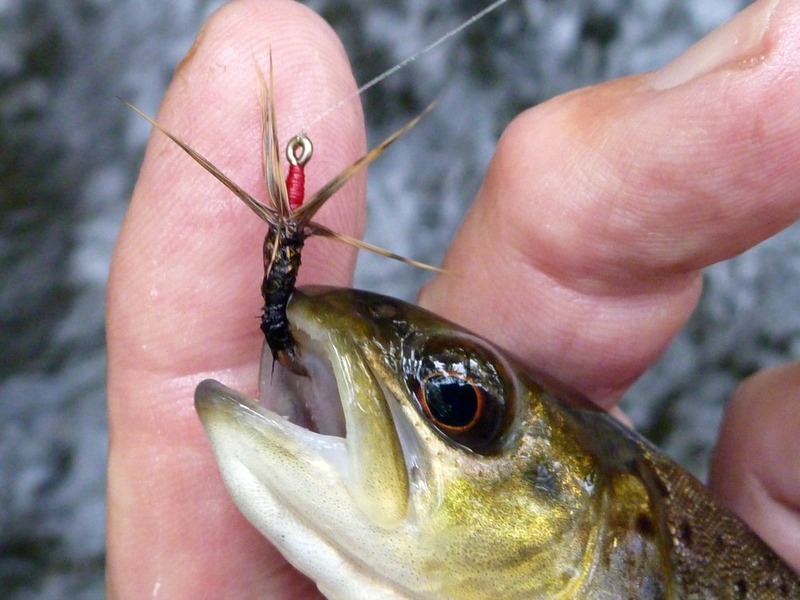 With a heavier line, a larger, bushier fly is better. It will have more resistance to being pulled through the water, and that added resistance can reduce the amount of line sag, helping to keep the heavier line off the water. The largest, bushiest flies I had with me were some kebari given to me by Chairman Shiozawa of Tenryu. They are big flies, maybe a size 8. 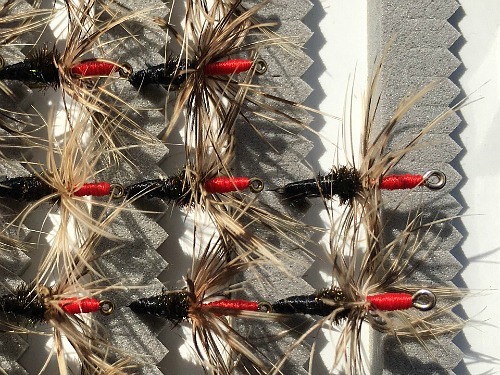 Their most striking feature is their long, bright red head, which is followed by a bushy hen pheasant hackle, peacock herl and a tapered thread body. Most have black bodies, some have green. By then it was the end of the day, but I wanted to try the larger, bushier fly with a size 4 line on the TenkaraBum 36. To say the experiment was a success would be an understatement. The first cast produced a strike as soon as the fly hit the water. Of course, I missed it. In very short order, though, I got three more hits and was able to get each one into the net. Then, with failing light and concentrating on the riffles in front of me rather than the trees behind me, I managed to catch a branch that was large enough and high enough that there was nothing to be done but break the tippet. I do have a few more of the Chairman's flies, though, and after the success I had with the first one, you can bet I'm going to fish them. I'll keep one as a pattern, but the others will be fished hard. 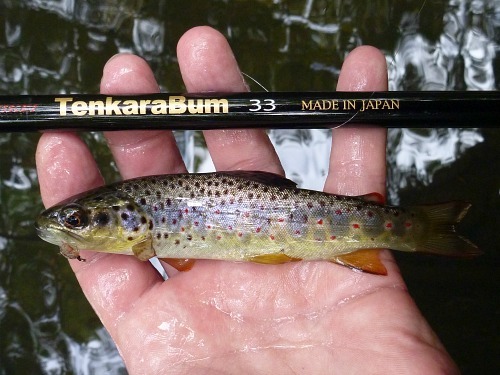 Based on my understanding of Japanese tenkara conventions, they probably don't have a name other than just "kebari." However, it seems we in the US can't talk about or write about a specific kebari pattern without giving it a name. I think I'll call this one Tenryu Kebari. If I later learn it actually does have a name I'll use the given name, but I bet it doesn't - or rather, didn't.